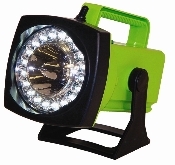 SHO-ME SPOT/FLOOD RECHARGEABLE LIGHT. Dual function LED Rechargeable Light lets you switch from intense spot light to wide-angle flood light with the flip of a switch. One 5W LED projects a narrow 3° spot beam for up to 5 hours per charge. Twenty high-performance LEDs produce a wide-angle flood light for up to 50 hours per charge. 100,000 hour bulb life ensures long-lasting light and reliable performance. Five year warranty on LEDs. Maintenance- free LED array creates a clear bright white light. Multi-position adjustable base has positive-locking ratchets that hold the light beam in place. Professional-grade rechargeable battery provides dependable, portable, cordless operation - field-tested for more than 25 years. Engineered to prohibit deep battery discharge. Low amp draw conserves battery life. Recyclable 6 volt, 4.5 amp/hour, sealed, lead-acid battery can be recharged 100's of times. Built-in overcharge protection light and battery condition indicator. Neoprene-booted, weather-proof, center-off toggle switch controls flood and spot functions. Contoured "sure-grip" handle is sized to accommodate large hands. Quick-release charging base is available in three styles: 110V AC, DC Plug-In or DC Hardwire Charger. Non-conductive housing is available in your choice of black, blue, red, safety green or yellow. Light comes complete with one rechargeable battery and choice of AC, DC or DC hardwire charger. Measures: 5-1/8" diameter x 9"L. Weight: 3 lb. 7 oz. Made in the U.S.A.